The Express underground belt is the third tier of Underground belts. It has a maximum underground length of 8 tiles—2 more than a Fast underground belt and 4 more than a basic underground belt. The speed of the Express underground belt is the same speed as the Express transport belt, which is three times as fast as a basic Transport belt or underground belt. 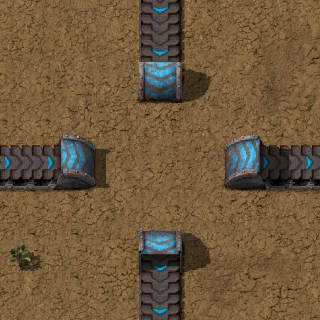 Express underground belts have a maximum distance of 8 squares. Express underground belts require lubricant to match the express belts and express splitters.